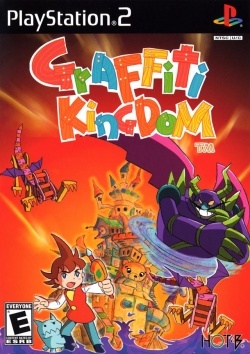 Game description: Graffiti Kingdom is the sequel to Magic Pengel, an action adventure game developed by Taito. In the game, you play as a prince who must use his magic wand to save his parents and his home. Use the in-game drawing tools to transform your character into three different creatures at anytime, turn 2D shapes into 3D objects, and pull off a variety of special attacks. As in Magic Pengel: The Quest for Color, the player is able to create characters (known as "Graffiti Creatures") by drawing its body parts and assigning a function (such as "leg" or "head") to each part; however, unlike the previous game, its attacks and movement can also be customized. Additional functions are added as the player's level increases, and new attacks can be obtained by "capturing" other creatures. This page was last edited on 19 September 2016, at 19:11.